#4 in Scott F. Guinn's "Sit-Down Coin Magic" Series, Three-Piece Combo is a coin routine that really packs a punch. This professionally routined, multi-phase coin routine flows from one sequence to the next in a magical ride building up to a knockout climax! From a coin purse clasp (no bag attached) three silver coins are visually extracted. One of these changes into a Chinese coin with a hole in the center. The two silver coins travel, one at a time, to magically join the Chinese coin in your closed fist. Next, all three coins are seen and heard to be placed in your closed fist, but when the fist is opened over the purse frame, they vanish into thin air! The coins are then reproduced from the purse frame, one at a time. The Chinese coin is placed on your open right hand. The left hand covers it briefly, and it changes back to a silver coin. Finally, all three coins again vanish together in the purse frame. No gaffed coins are used. There is some sleight-of-hand, but nothing difficult. You end clean, with just two empty hands and the purse frame. Three-Piece Combo demonstrates once again why Scott's routine construction is so highly regarded. Written in the now-famous crystal clear and conversational Guinn style--and accompanied by over 50 instructive photographs, you will have no trouble learning this amazing and entertaining piece of magic. Scott doesn't skimp on quality; he includes a sleight index, an extra bare bones explanation to aid in working through the routine, and all the extra little tips and touches that turn a trick into magic. 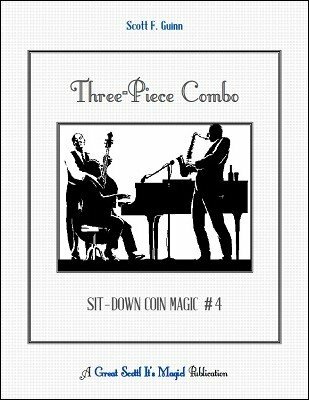 If you liked the first three installments of the "Sit-Down Coin Magic" series, you're going to love Three-Piece Combo ! If you haven't yet been introduced to Scott's elegant coin work, this is a great place to start. At just $10, you get much more than your money's worth. 1st edition 2016, 55 pages.